(6:57 p.m. EDT) -- The only two cruise ships visiting the Hawaiian Islands this week -- Norwegian Cruise Line's Pride of America and Royal Caribbean's Radiance of the Seas -- will sail modified itineraries to avoid the brunt of Tropical Storm Olivia, which is expected to hit the islands on Wednesday morning. Pride of America, which departed from Honolulu on Saturday, September 8 and spent its first two days in Maui, skipped Hilo today and instead called at Kauai -- from where it will be able to head out to sea tomorrow to avoid the storm. The ship will return to Hawaii once the storm has passed, visiting Hilo on Thursday and Kona on Friday. "The safety and security of our guests and crew is always our top priority," Norwegian said in a statement. It added, "We are closely monitoring the storm and will provide additional updates as they become available." Meanwhile, Royal Caribbean's Radiance of the Seas is due to arrive in Maui on Thursday. A spokesperson for the line told Cruise Critic the ship will stay in Maui longer than planned -- through 10 p.m. on Friday -- forcing it to skip Hilo. The rest of the itinerary remains unchanged. The ship departed from Vancouver on Friday, September 7, and is the middle of repositioning to Australia for the upcoming season. 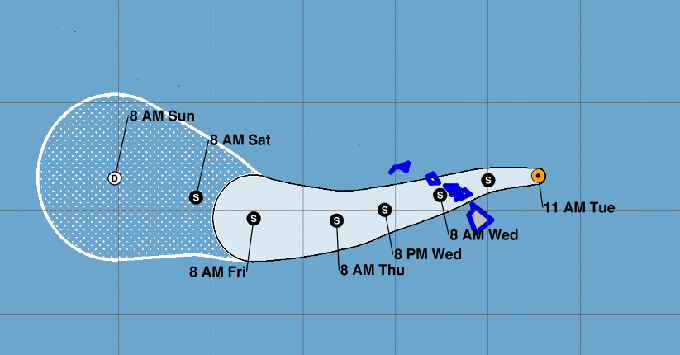 Tropical Storm Oliva is swirling off the coast of Hawaii, 275 miles east of Kahului (Maui), with maximum sustained wind speeds of 60 miles per hour. Increasing winds and showers are expected to begin tonight, according to the National Hurricane Center, and a tropical storm warning is in effect for all the islands. In the Atlantic Ocean, Major Hurricane Florence has already rerouted several ships, while Tropical Storm Isaac has so far affected two ships. Cruise Critic will continue to update this story and the others as more information becomes available.